As we head into the New Year, The Malinois Foundation is grateful for all who have supported our cause and helped us brighten the lives of veterans in 2017! 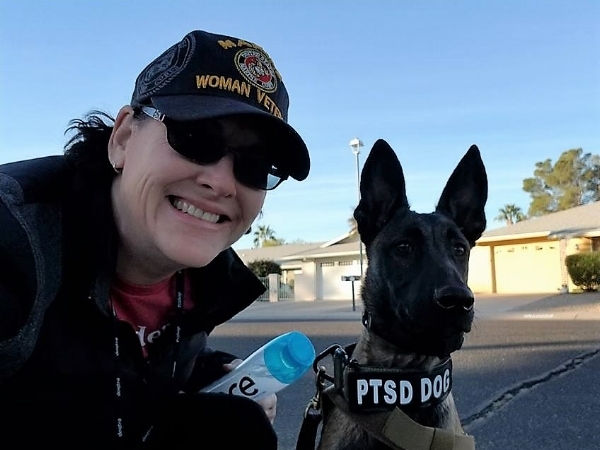 Our newest match came last month when Circe, a 6-month old Belgian Malinois was placed with Deborah Mann, a United States Marine Corps Veteran and survivor of Military Sexual Assault (MST). In the years to come, Deb will rely on Circe for both psychiatric and mobility support. Upon arrival in her new Arizona home, Circe immediately connected with her new handler and the very next day, Deb mentioned how loved and protected she felt. This pup is energetic and passionate about her new work. We're excited to follow the progress this handler and dog team makes in 2018 with continued training donated through Dog Training Elite Arizona. If you, a loved one or friend is in need of a service animal for PTSD, Mobility Support or Special Needs - please reach out to us at (801) 898-3023 or themalinoisfoundation@gmail.com. Newer PostJeff & Marshall To Unite April 2nd! Older Post1st Annual Vino for Veterans Event a Success!